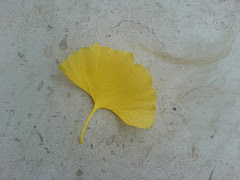 * Added topic: Trendspotting: Ginkgo. Old Ginkgo in Beijing gets "operation"
Botanical experts gathered Monday in Beijing's southern district of Daxing on a consultation for protecting a 1,000 years old ginkgo tree. 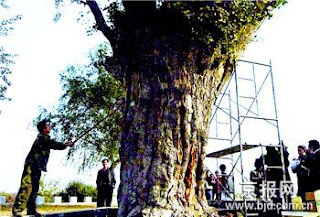 After a series of health checks, the experts from the eighteen districts and countries of Beijing decided to perform an "operation" on the tree, considering there is barely any leaves on some of its branches and part of its trunk is hollow. They began to cut some dead branches off the tree and spread some fertilizer and insecticide on the leaves. The hole under the tree root was filled in. They also improved the soil conditions for the tree. On Expert-Village, a how-to video site, you can see videos by Susan Ting of the making of a double-walled teapot from clay with a Ginkgo leaves design. * Added recognition by The National Science Digital Library (NSDL) that provides organized access to high quality resources and tools that support innovations in teaching and learning at all levels of science, technology, engineering, and mathematics education. * New photo photospecial page: Ginkgo bonsai in Biot. 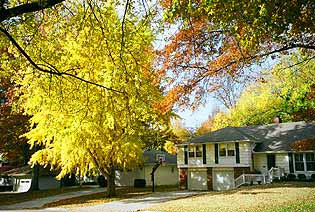 * Added 3 YouTube videos: Kumamoto old tree, Japan; trees in Seoul, S.Korea; art 'yaprak ginkgo'. "Upon entering the classroom with the boys, Emma presented Elliot with a homemade envelope, decorated just that morning by Thomas (one of Elliot’s school mates), full of gorgeous yellow ginkgo leaves. She had found a whole street of them on her way to work, pulled the car over, gathered some, and made a present for Elliot (with the other children’s help) once she arrived. Oh, there is so much love at that school. Elliot’s face was worth a million words, and he went over to thank Thomas for his beautiful artwork on the envelope." "Cuando yo era pequeña cada otoño mi abuela me avisaba para recogerlos en el parque del castillo. Los teníamos bien fichados…. xd. Después, con un mazo de madera, ibamos dando unos golpes a caad fruto, que llamamos GUINNAN, y después tostamos igual que las castañas en la sartén vieja. cuando estén bien tostados, el fruto se convierte en un color verde-amarillo vivo y transparente. (mientras está opaco, es decir, aún falta la coción.)" 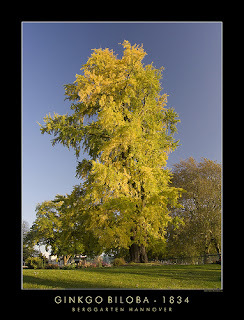 Beautiful photo of a Ginkgo of 1834 in Hannover (Germany) in Berggarten. Click here to see an enlargement and more great photos.